It would be impossible to come to Buenos Aires without feeling the presence of Tango. No, people do not tango dance as they walk down the sidewalks. Yes, there are many tango street performers and photos on every café wall and wonderful places where people strut there stuff. We wanted to be a part of it! Our preparations for Buenos Aires began in October 2011 when Carmen and I began taking classes at the YWCA in Berkeley. Genie and Jonus were amazing teachers and they taught us moves that were essential to understand the rhythm of the dance floor. There was so much more than then booty shaking that my brother and I call dance. 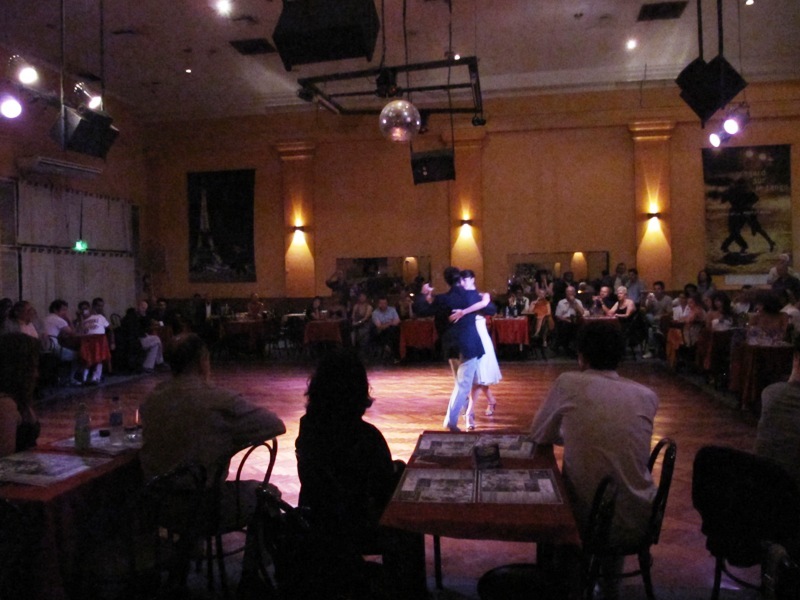 The milonga is a place where people dance tango. There is of course a dance floor and music and a whole etiquette to go with it. Two tango dancers ask and accept a dance by looking and gesturing without words with what is called a cabeceo. Those dancers then dance a set of 3-4 songs called a tanda. Then the dancers separate and either dance with new partners or take a break. I was not confident enough in my moves to have a cabeceowith anyone but Carmen, but some nice older women stared at me pretty longingly. One deserves to be mentioned because she had purple parachute pants that had slits along the inside of the leg, high up the inner thigh. I shifted my eyes quickly to Carmen. The intimacy of tango is spectacular, the street performers are pretty cheesy, but at the milongas you see complete strangers pressed tightly together, the woman’s forehead gently pressed into the man’s cheek or jaw and their bodies moving in what can only be described as poetry. And people flock to see this, hundreds of people are spectators to this public display artful passion. Carmen and I danced at three milongas and we learned that there is so much more to learn about the dance and so much more that we can do to be more comfortable on the dance floor. The easiest thing about this public dance is that there are people of all skills and speeds. One couple can be having an intimate moment slowly walking and another can be twisting a kicking all over the place. Everyone was very courteous and understanding that Carmen and I were beginners and that to dance tango you really have to dance tango. 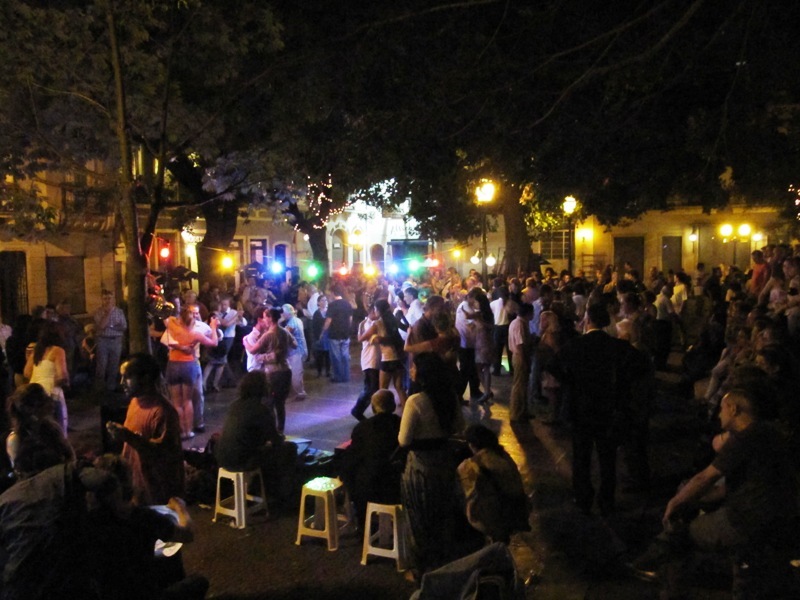 And so we did: our first public tango was at the Plaza Dorrego on Sunday at the end the San Telmo Feria. 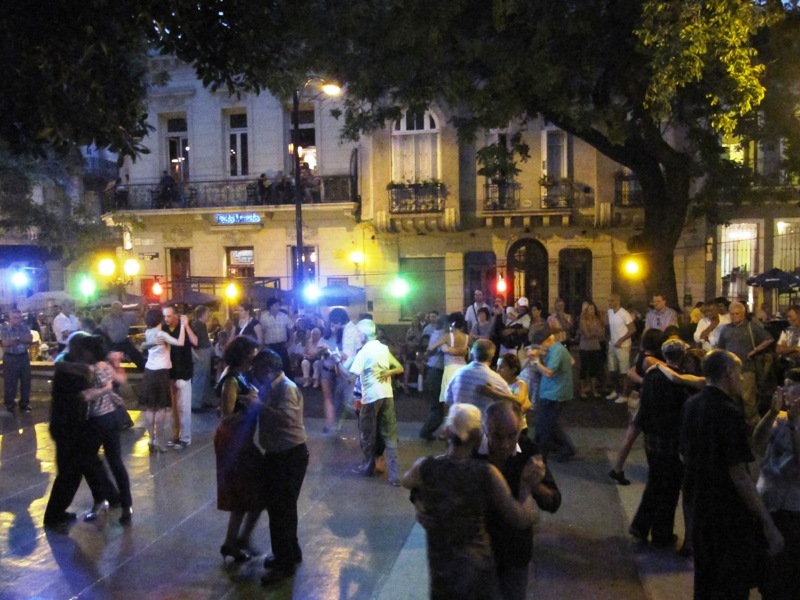 During the day, professional tango dancers perform here and in the evenings they setup a dance floor for locals and tourists to dance. The whole scene is pretty daunting because there are over one hundred spectators and another 25-30 couples all moving counterclockwise around the dance floor. With a little sway to the music we took our first steps. We walked forward, then pause, then side-step and turn…we were tangoing! Then another move, a forward ocho, then a spin, walk, turn, walk, mollinete. This was all coming together. Whew…then we sat out a few songs. Then we tried it again, this time with a backwards ocho and a sweep, a stumbled success! Milonga two was one week after at the same outdoor milonga. We were comfortable here and this time we had spectators! Carmen’s parents joined us. Again we focused on walking and feeling out the dance floor. It was more crowded this time. We bumped a few people, but all in all the dancing was wonderful. We were starting to get the hang of this. Carmen even told me to stop making her forward ocho. This has become my most accessible flashy move. When watching other dancers the women moves 2-3 times in a “ocho” twist then they are immediately transitioned into some other step or embrace. I proceeded to lead Carmen into a forward ocho that moved back and forth 8-10 times before turning her sideways to do it again. And damn were we good at that! I particularly like the move where I slide my right foot in front of hers and she has to stop, step over my leg with some playful caressing of her foot on my calf. This type of playfulness with the feet takes some finesse and one of the things that I most enjoyed about watching the dancers at the milonga. At the third milonga were in the major leagues ready to play tee-ball on the dance floor. We went to Salon Canning in the Abasto neighborhood. We arrived at 10:15 and of course it was practically empty with 15 or so people there. By 11pm the dance floor was busy and the DJ was playing classic tango tunes. I really wanted a lesson in BsAs, but there was so much to do that we could never fit it in our day’s activities. My feet were itching to get out there anyway…Carmen and I locked eyes and we were on the floor. We decided to dance the entire tanta with only walking. I think this was the best effort so far in understanding Carmen as a partner and communicating to each other on the dance floor. A few more songs and we were spinning, kicking and dancing tango. There were some amazing dancers there as well. They were too good to learn from, but there were some couples slightly better than us and we could recognize their moves and give them a try. At about 1am a professional couple came out. They moved with such grace, their dance was not rehearsed, but they could move around the floor so effortlessly. One press on the back and a side stet would trigger a sway and a flirting of the woman’s foot, another step and the spin around, then fast, then slow. A whole story was told just in their dance. We watched with our jaws dropped, we gotta tango more. Milongas are a place to socialize as much as they are to dance. 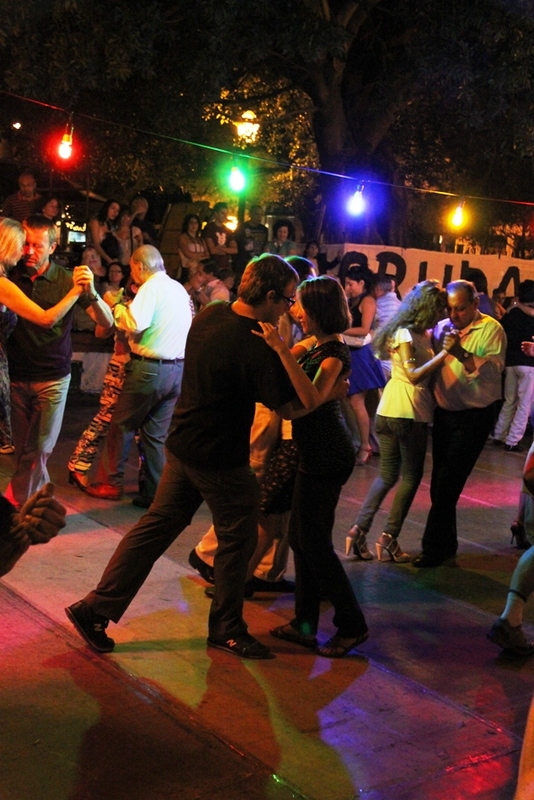 The outdoor milonga is very informal with t-shirts and sandals alongside elegant dresses. The indoor milonga was a little more formal with men wearing pants, but there were some t-shirts. 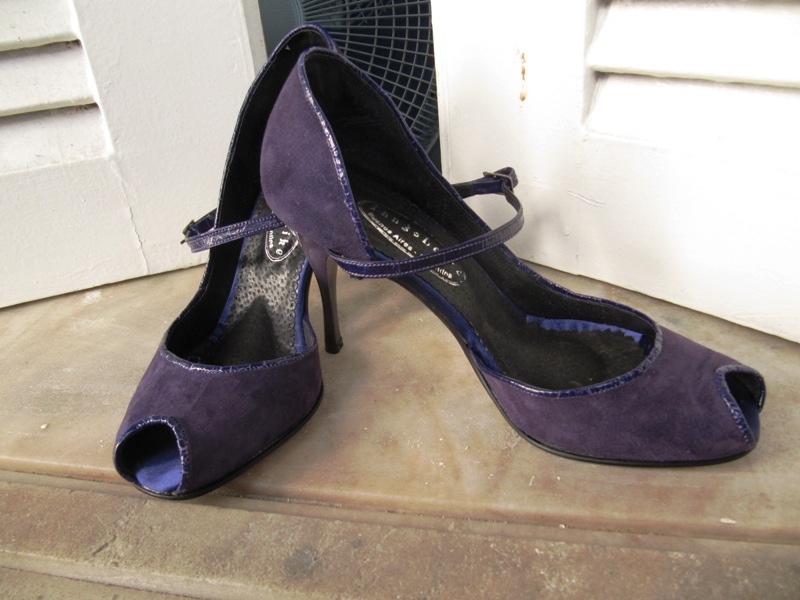 Most of the women were wearing dresses, but all the women had tango shoes. embellishments as follower steps over leg: slide leg up and down, tap leg, etc. leader then faces the follower and sandwiches the follower’s foot with his feet. He steps back with his sweeping foot and pulls follower in. embellishments as follower brings weight forward and the former standing leg in: trace a half circle, run foot up leaders leg, etc.